Calum MacLeod’s brilliant 140 stunned England as Scotland claimed an historic first win against the Auld Enemy in Edinburgh. t was his 7th century in ODI’s and came from just 70 balls. 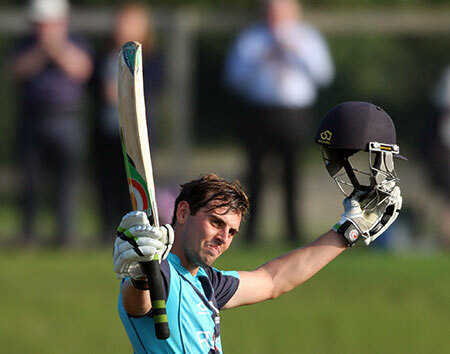 The tone was set for the innings as openers Kyle Coetzer (58) and Matthew Cross (48) went for the jugular in a frenetic opening stand of 103 in 82 balls. Both fell in quick succession, but there Scotland didn’t take a backward step and with MacLeod in imperious form, the runs and boundaries kept flowing. He added 93 with Richie Berrington (39), 107 in just 83 balls with George Munsey (55) and dominated a fifth wicket stand of 53 with debutant Dylan Budge (11). A final total of 371 for 5 was a record for Scotland, but there was a sense they would need them all at the half-way stage, and that’s certainly how it played out as England came out and counter-attacked. Johnny Bairstow scored his third consecutive ODI hundred as he added 129 in 76 balls with Jason Roy (34). He reached his landmark hundred from only 54 deliveries, hitting 12 fours and 6 sixes, and while at the crease it looked as if Scotland would be denied. However, Scotland kept chipping away and never let their heads drop, even as England raced to 220 for 2. They were helped by a series of poor shots by England, and with five wickets falling for 56 runs, Scotland sensed blood as the total read 276 for 7. England though bat deep, and it seemed as if Moeen Ali (46) and Liam Plunkett (47*) would be their saviours as they added 71 in 9 overs. However, Watt had Moeen caught in the deep, Rashid was run out coming back for a risky second to leave the game on a knife edge. With seven needed from eight balls, Sharif trapped Mark Wood lbw an inswinging yorker to spark scenes of wild jubilation all over the ground as some of the crowd invaded the pitch. After the disappointment of narrowly missing out on World Cup qualification, skipper Kyle Coetzer was justifiably proud of the effort of his team. "The win means a lot to the guys,” said Coetzer. “We've created an electric atmosphere and it's something we need to do more.